In 1673 Finns began migrating to the north and settled on the banks of the rivers Kemijoki and river Kitinen. 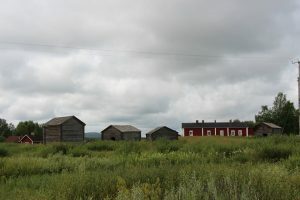 We will visit some of these historical villages (such as Pyhäjärvi, Suvanto, Kairala and Pelkosenniemi). You will also learn how the Finns were received by the Sámis as these parts were regarded as Sámi territory. Suvanto is one of the few villages, which has survived from destruction in World War II. Its architecture and athmosphere with the landscape are great experiences around the year. This village has been granted Europa Nostra price and it is also in the list of UNESCO World Heritage. Coffee and snacks will be served during the tour. Options/Extras: Visit in reindeer farm 30 €/person. At the reindeer farm you will see these beautiful animals up close and feed them. You will also hear about their amazing life and how they survive the cold winter.